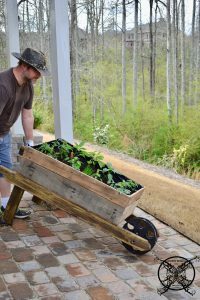 Here is how to make a Wheel Barrow O’Plenty Garden, so you can be growing your own container plants in no time flat. Let me just start by saying, I love to think “outside the box” or in this case the wheelbarrow. In fact, I am not sure I spend very much time actually in ” the box” at all, lol. For those of you just joining here is a picture of where this wheel barrow started last fall. My husband actually constructed this beauty for me out of left over pallet wood, with one arm in a sling. Seriously, no lie. He was still recovering from a Labral tear in his shoulder that required surgery. Yes I know he is s total keeper! After the season we stored the wheelbarrow in the basement where I toyed with what it’s next life would look like. Anyone that knows me is painfully aware I hate to do the same holiday decor over and over again, so I am constantly recreating my theme, so the harvest cart would not be making an appearance next fall. So it only made sense to have it become a cute little farmhouse style mini vegetable garden for the summer. In order to do this we knew it would have to have a liner added to the inside to keep the dirt from sprinkling out over time. 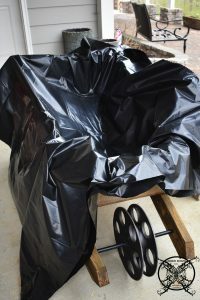 DO NOT use a trash bag it will rip! These are the supplies we used. 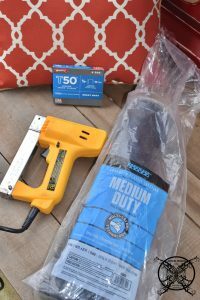 The first step is to press the liner into your cart or crate. Making sure that you have no air pockets or extra space left under the liner which could cause it to rip of tear. 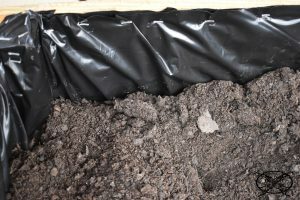 We ended up deciding that if put half of your garden soil into the liner it helps to settle it into the crevices, prior to attaching. The weight also keeps your liner from blowing away if it is a windy day, like it was for us, lol. 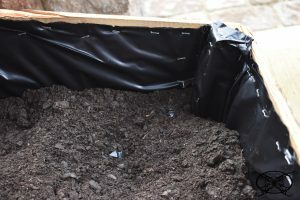 Once you have a base layer of soil you will want to pull the liner slightly taunt and use your staple gun to attach it to the inside of your cart. The corners are kind of like wrapping a present or upholstering, you want to fold the excess liner under itself and staple through the top. After you have completed the cart you can cut off the extra liner for a flush look. At this point you will want to punch a few drill holes into the liner so it does not hold too much water during rain storms or watering. 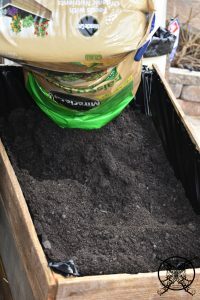 Then you want to fill the cart the rest of the way up with your garden soil. 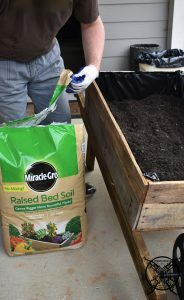 We personally love the Miracle Gro raised bed soil and have had a lot of luck with it over the years. I also really like the Miracle Gro moisture control soil for my flowering plants. Once you have gotten the cart filled, it is time to add you garden plants. Here in Georgia we have a lot of luck with tomatoes and peppers, which is probably due to the heat. So I got four varieties of tomato plants, one for each corner so I can add tomato cages as they get bigger. 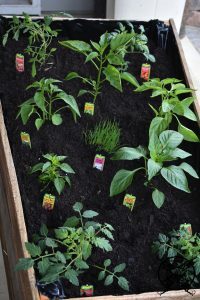 Then we added 4 varieties of pepper plants with a focus on jalapeños and chilis. Again, these are tried and true varieties that do well in containers gardens in our climate. The beauty of this garden is that it is moveable. So as you can probably tell when we planted this earlier in April, the weather was questionable and we were still having cold nights with freezing temps. We were able to bring the cart inside easily. Also, if you find that the sun is too hot or your plants prefer morning sun you can just roll your cart around until they are happy. To give it a more built in feeling you can surround it with other containers. I find that a simple layered effect of plants in urns, pots or crates creates a nice rich lux look with out breaking the bank. This was a look at the little garden when we planted it a few months ago. 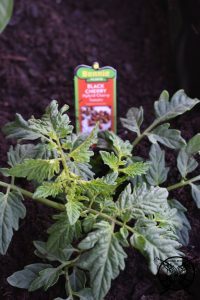 There were several nights we were so glad that we could bring these tender little plants inside, and now they actually have buds and baby tomatoes starting to bloom. I am so excited to be able to get fresh goodies to add to my salads all organically grown from my own little garden. Be sure to check out my 2018 Outdoor Living Summer Blog Hop, going live this week to see more fun gardening tips and tricks just in time for National Gardening Week! *Please note that this post may contain affiliate links for your convenience. These involve no extra cost to you, but may result in me receiving a small commission – for which I am very grateful! You can view my full advertising disclosure here. I am so happy that you shared this helpful info with us. Please stay us up to date with great stories like this.Thank you for sharing. Great post, however I was wondering if you could write a little more on this topic? I’d be very thankful if you could elaborate a little bit further on your fantastic gardening techniques. Thank you! I certainly do like the idea, it is really cute. 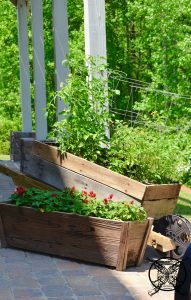 This is a fun idea for people that do not have a lot of space for a large yard garden. It really is a cute container garden and so creative. Whoah this blog is magnificent I like reading all of your articles. Keep up the good work! I am sure you recognize, a lot of individuals are hunting round for this info, you could really help them out greatly. fantastic points altogether, you just received a brand new reader. 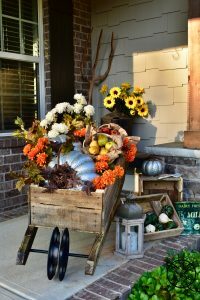 This is such a cute use of this wheelbarrow from last fall. I like that you repurpose so many of your previous projects. Love this idea, what a great idea to make this a little garden. This piece of writing presents a clear idea that is really great for the viewers of this blog, you are truly show us how to do blogging and site-building. Thanks you. I love this little wheelbarrow that you turned into a garden. I had no idea that this part of your fall decor from last year, until I saw the link. You really do know how to reinvent the season’s and your imagination always amazes me. Did you know I just realized that this was your Fall Decor last year? OMG! I completely forgot this was on your porch until I looked at your Fall Home Tour again this morning. My friend this was such a brilliant reuse of that cart, you really amaze me sometimes. Such a cute idea, I really like the small garden cart you made. 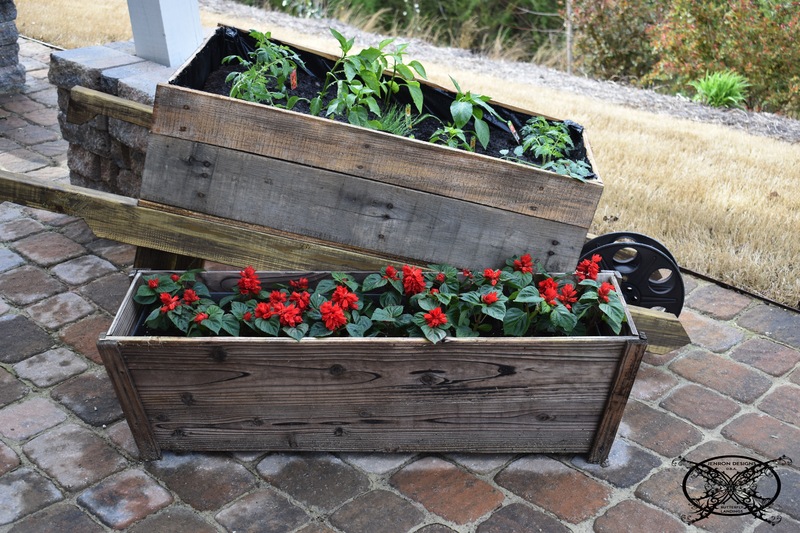 What a fun way to reuse your fall decor as a summer garden, you are so creative. What a great idea, I saw this cute little cart on your instagram account but I had no idea that it was one of your DIY projects until your mentioned it in your tomato post, I like the idea of it being a salsa cart, lol. That is pretty darn funny. I remember seeing this cute little wheelbarrow last fall on your porch now you have made it a garden. I love this idea, you are so creative. That wheel barrel is so cute. Time to get in the garden! I absolutely love this! What a cute way to brighten up a garden or front yard. And it sounds fairly easy to make as well. 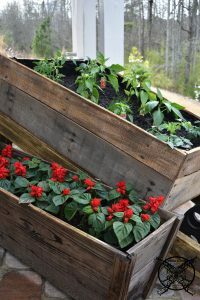 I don’t have a garden but I keep bookmarking garden-inspos and DIYs for when I do, this is going on the list! 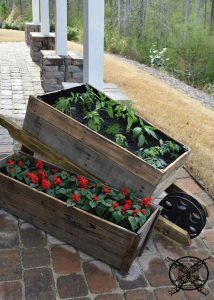 I love the wheel barrow and it makes an awesome looking planter! This is such a cute idea! I see a summer project in my future! They are so pretty I love the idea! Thanks for the inspiration. What a great idea. My partner would absolutely love this. Thanks for sharing.! What a great idea! I love gardening, and this would make a great project for my husband. I love how you turned a wheelbarrow into a garden! That’s such a great idea and it’s super cute! This is so cute and looks pretty simple to make! Thanks for sharing this. Save my name, email, and website intros browser for the next time I comment.